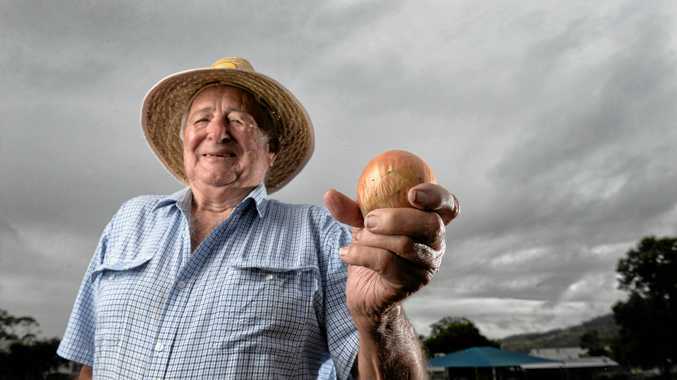 ONION forecaster Hally is 'the chappy who organises the rain'. 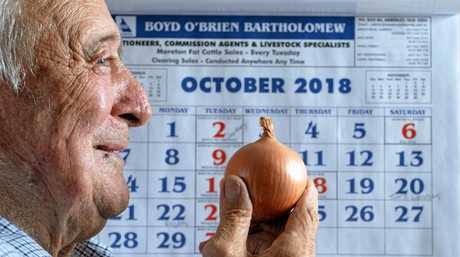 Halwyn Herrmann, 78, hasn't got his forecast wrong in the 60 years he has followed the German onion tradition, including his early forecast of the drenching across the southeast this month. "I'm really pleased I answered the call from the paper on September 8 for rain in October," he said. "We have 120mm so far in October and I'm really happy with that. Hally the weather man: How to use an onion to predict rain. "I forecast the rain and we got it. I'm the chappy who organises the rain." Hally said his onion was predicting more showers next month. "We'll get rain in November but not as much as October. December should be a fairly wet month," he said. "My prayers were answered, thank you." Hally and his onion are strictly rain forecasters, and regretfully he was unable to predict when the heat wave sweeping the southeast would ease. "You peel the onion and cut it in half. Half falls to the left and the other half to the right. The left side is first and you take off six rings which are for January to June, then the other half goes from July to December," he said. "Then you put your salt in the ring and leave it until 4.30 the next morning. It makes water from the salt and you just measure by eye - you guess how much is in there and the more water there is, the more rain for that month."